Iratxe Jaio (Markina, Spain, 1976) & Klaas van Gorkum (Delft, The Netherlands, 1975) have been working together since 2001, producing performances, videos, publications and actions.1 They have created projects that explore public and private spaces and the use thereof by individuals and collectives. Using documentation as their work methodology, they analyse and question social and political issues concerning everyday contingencies. Their work has been exhibited at MUSAC, León, TENT Center for Contempoaray Art, Rotterdam, the Museo Nacional Centro de Arte Reina Sofia and de Appel, Amsterdam among other venues. In the following interview with Afterall's Paula Barriobero, Jaio and van Gorkum discuss notions of communities, social and activist practices and some of their projects, as well as their recent experiences at Occupy Amsterdam. 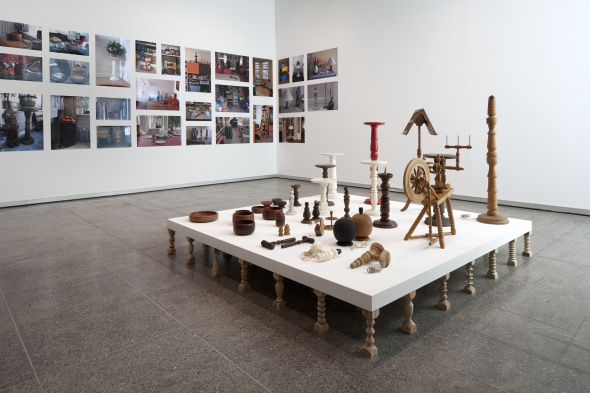 PAULA BARRIOBERO: In your last project, Producing Time in Between Other Things (2011) at MUSAC in León, you pay homage to the artisanal work of Jos van Gorkum, Klaas's grandfather – particularly a metal box belonging to him, containing ephemera relating to his post-retirement hobbies. When did you decide you wanted to make a project about Jos van Gorkum's legacy and how did it work? IRATXE JALO & KLAAS VAN GORKUM: The metal box has been with us for a long time. As with many other hunches and ideas, it sat on a shelf, awaiting the right set of circumstances. We made a habit of opening it at least once a year, to go through the pile of notes and half-finished sketches, while discussing the notion of artistic practice and its relation to contemporary culture. There was something about the connection between Klaas's grandfather and the objects he was making that held our interest. These were not the authentic products of an artisan living in an artisan's world, but those of a retired factory worker; someone who had lived in an industrial world, and who was just beginning to reap the benefits of an emerging social welfare state. His wood-turning hobby was a pensioner's pastime, a simulacrum of a way of life lost in history. It suggested that the most significant product of his hobby might very well have been the hobbyist himself. So we moved on from just leafing through this yellowing archive to physically working with the original lathe, placing ourselves in the same position to find out how that would reflect on our own artistic practice. PB: You were reflecting on the relationship between work and free time­, in relation to the material labour of craft and the immaterial labour of cultural production. Could you expand on that? IJ & KvG: The rights and benefits that previous generations fought for are slowly being eroded in the name of increasing productivity. Today, people are expected to work longer hours, and retire at later ages than before. As more and more aspects of our existence, such as our social networks, or cultural production, are infused with neoliberal logic, the distinction between leisure and working time dissolves. This is most clearly the case for the so-called 'creative class', whose social and cultural capital fuels a growing industry based on intellectual property and the segregation of material and immaterial labour. With Producing Time in Between Other Things, we wanted to look at our own artistic practice in relation to these developments, by investigating the correlation between three separate regimes of production: the artist in the studio, the worker in the factory, and the worker at home, in his 'free time'. PB: The exhibition formed part of 'Amikejo' (2011–12), a series of four exhibitions at MUSAC curated by Latitudes, based on the work of four artist duos. How do you normally work and develop your projects as an artist duo? IJ & KvG: We have been working together since 2001, but we didn't always consider ourselves an artist duo per se. Two just happens to be the smallest number at which one can start speaking of a collaborative artistic practice. We're interested in the processes that lead to collectivity, without idealising the conditions under which that happens. Conflict and dispute play a big part in these processes. Nevertheless, we believe that it is in a state of crisis that collaboration is at its most inspiring, when the common ground between those involved is a contradictory and inconsistent mesh of personal projects that happen to coincide and challenge each other. PB: One of the participatory projects that you have made has been Stay Inside. Close Windows and Doors (2008). This project consisted of two ‘zombie walks’ held in Utrecht and in Bilbao. What was your involvement with these local communities? IJ & KvG: The term ‘local communities’ is a symptom of institutional expectations of artists working in a specific social context. It all too often indicates the existence of preconceived notions of what the target group is, and how its collective identity fits neatly into demographic categories. These preconceptions tend to turn the artist into an outsider from the outset, even before starting to work. In our projects we take as a point of departure the ideas and subjects that rise out of everyday life, and treat them as the common ground on which different kinds of collaborations with other people may potentially develop. The ‘zombie walks’ we organised in Overvecht and Barakaldo (a suburb of Utrecht and a municipality of the Biscay province, respectively) were based on an open invitation to which anyone could respond, for whatever reason, with whatever background. By joining us in disguise, participants willingly shed their individual identities to become part of a temporary community, united in the collective execution of a fanciful idea. The group identity of a mob of zombies on its way to the shopping mall is ostentatiously fictional, and as such it could be read as a mockery of all too rigid definitions of what constitutes a community, local or otherwise. PB: I would like to talk now about the widespread cultural cuts due to the recent waves of economic crisis. Of course these are not restricted to the Netherlands, but as you are based in Rotterdam, how have you lived through these cultural cuts and how are they affecting artists and institutions? IJ & KvG: When the Dutch government announced the cuts in its culture budget, there was a great and indignant response from the art world, where it was perceived as an assault on culture itself. Unfortunately, most of the indignation from artists and institutions did not extend beyond their own interests, as they failed to acknowledge that the cuts were part of a larger set of austerity measures affecting all kinds of public sectors, such as health care, public transport and so on. We had mixed feelings about participating in these protests in name of the art world, since we believed that there was something larger at stake. What good was there in demonstrating for the leftovers of a cultural policy, when the social welfare state, whose ideological foundations it was based on, was being dismantled before our very eyes? All that these protests managed to achieve was to expose how estranged from society the cultural sector had become. PB: You have organised The Social Experiment (2011) with Wouter Osterholt, Jonas Staal and Elke Uitentuis. In one of your projects within the Experiment you hired a former member of the riot police to teach interrogation practices and techniques to a group of artists and students. Do you see yourselves as part of an activist practice? IJ & KvG: We formed The Social Experiment to provide a collaborative environment in which to elaborate and refine our ideas on how artistic practices may influence and even provoke social change. This initiative was prompted, in part, by our annoyance with the self-absorbed character of the art protests against the cultural cuts. So when the Spanish 15-M movement and Occupy Wall Street went global, and people started pitching their tents on city squares everywhere, we could hardly stand on the sidelines and watch. We bought a big army tent between the five of us, and joined the camp in the centre of Amsterdam. For the two months that it lasted, we were fully integrated in its daily routine. We did not consider our presence an art project in itself, nor were we seeking to turn the camp into a platform for our own artistic productions, choosing instead to remain subservient to a cause that was bigger than all of us. We were careful, however, not to assimilate entirely, by organising a program of activities parallel to that of the camp. This mainly served the purpose of acting as a bridge between Occupy Amsterdam and members of the art world who might otherwise not have crossed the threshold. Our group soon expanded to some 30 active members, and became known as the Artists in Occupy Amsterdam. But there was also an underlying purpose of maintaining some vestige of autonomy in relation to the camp, namely that which brought us together in the first place: the desire to explore the reciprocal relationship between artistic practice and social change. PB: Can you describe that relationship? Rather than just providing social critique through artistic means, we wanted to take an active role in translating the practices and desires of the movement into new norms and institutions. One of the most significant activities we undertook in this respect was to turn our tent into a kind of tribunal. The camp itself functioned as a living laboratory in which democracy was being reinvented from scratch. But this was not a trouble-free process. As a miniature society it had to cope with more than its fair share of social problems, such as violence, drug abuse and sexual intimidation. Dealing with these problems and keeping order in the camp introduced all kinds of ethical dilemmas, and opened the door to some remarkably undemocratic tendencies. Our response was to hold daily hearings in our tent, asking members of the camp to testify on specific incidents before a rotating panel of four hosts. We started it as an experiment, which granted us the artistic license to cast ourselves in the roles of prosecution and defense. But it soon became an institution in its own right, as it filled the need for a space of arbitration in the camp. It was also illustrative of the position we strove for in the movement, which is not that of the classical vanguard, determining its course from the front, nor that of commenting on it from the sidelines, but rather completely inside, embodying the very mechanism of seeking truth and justice with others. PB: How do you perceive the contemporary rise of activism? IJ & KvG: Even though one should exercise a degree of caution in ranging different social struggles under a common banner, there is no denying the international aspect of the protests taking place around the world today. Representatives from the 2011 Tahrir Square protests and Spanish indignados have made frequent appearances in our camp, for example, exchanging ideas and experiences and fostering links of affiliation. There is a growing sense that the effect of global economy on the way we are being governed is leading us all to the same crossroads, despite the different paths we may have taken to get there. What connects us, then, is the collective project of inventing new forms of social organisation around the notion of the common good, while the old structures are crumbling under the pressure of antidemocratic forces. PB: Your writings appeared in the now-defunct cultural magazine Mugalari, for almost a year, between April 2010 and January 2011. What is the relationship between your artistic practice and your written one? IJ & KvG: We believe it to be extremely important that artists write. It is a political responsibility, in the sense that artists have to find a voice of their own in the conversation on praxis and cultural production, instead of leaving all that to theorists. This is why we welcomed the invitation to write a monthly article for Mugalari, as it forced a certain discipline on us.2 Having to complete twelve articles also taught us how to broach a complex central subject, such as where we stand in relation to the notion of artistic practice, by covering the ground around it, i.e. by focusing on separate, but related, subjects and issues (anonymity, relations of production, collaboration, etc.). As we came closer and closer to that central subject, though, we discovered it had turned into a moving target, as our writing had started to exert its influence on our artistic practice, transforming the ideas we started out with.